Glen Echo Glassworks is the Washington, DC area’s first glass school, and continues to provide one of the only area studios for blown glass instruction, exhibitions and special programs under the direction of artist Paul Swartwood. Classes are offered year round for beginner through advanced levels and open studio time is available for experienced artists. 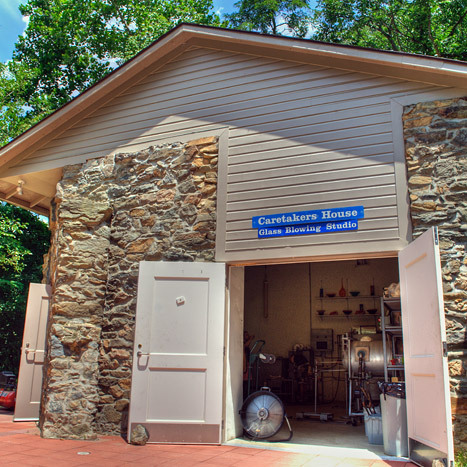 Located in the former Caretaker’s Cottage, the studio is open to the public Saturdays, 12pm to 4pm, and by appointment, to observe glassblowing demonstrations and see work by Glassworks artists. Phone: 301.634.2280. Glen Echo Park began in 1891 as a National Chautauqua Assembly, teaching the sciences, arts, languages and literature. By the early 1900s, Glen Echo Park had become a premier amusement park, serving the Washington D.C. area until 1968. In 1971, after the federal government obtained the land, the National Park Service began managing the Park. The National Park Service collaborated with artists and arts organizations to create a rich arts program in the spirit of the original Chautauqua movement. Today, the Park’s programs and facilities are managed by the Glen Echo Park Partnership for Arts and Culture, Inc., a nonprofit organization, while the National Park Service continues its role in managing the grounds and providing historical interpretation. The mission of the Glen Echo Park Partnership is to present vibrant artistic, cultural and educational programs at Glen Echo Park and to promote the Park as a unique destination for our region’s diverse population. The Partnership nurtures a dynamic community of artists and performers while preserving and managing historic facilities within this unique National Park.